We can put any photo, message or corporate logo on a personalised photo mouse mat. Our quality mouse mats are made from premium quality 100% natural rubber. Your image is optimised when printing to ensure the very best colour rendition from your photos. The mouse mats have a wipe clean surface and are extremely hard-wearing. Both normal mice and optical mice can be used with our mouse mats. Rest assured, if there is a problem with your mouse mat image we will call you to let you know before starting work. We will use our best judgment when optimising your image and text to go on your mouse mat. Pop into our store in Camden London and chat to our friendly staff about your ideas. Alternatively, you can order online using the link below. 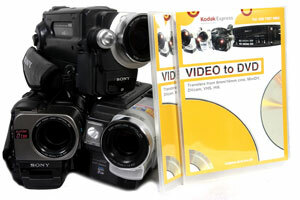 Kodak Express Camden have in house facilities for transferring camcorder tapes to DVD and editable files. All formats of cine film are catered for including VHS ,Hi8, MiniDV and many others. Fantastic News - Gift Vouchers are available for all our photo shoots and make fantastic presents for someone special. We will take stunning studio photos of you and your family, friends and loved ones.